Small ripples flow toward my chair at the edge of the lake, the aftershock of ducks playing across the way. They’re getting their morning bath in the cool water. I tug the plaid afghan tighter around my shoulders while waiting for the morning sun to breathe warmth across eastern side of the farm. The hens are already cackling, their voices overpowering the rooster who has been crowing since 3 a.m. One must have laid the first egg of the day. She and her sisters are letting the neighborhood know about it. I take a sip of my coffee before opening the pages of my leather notebook, a gift passed down from my grandfather. I need to continue penning the great Southern American novel before hitting the fields. A few crops from the fall plantings remain. It’ll be winter soon. My morning routine will need to adjust. For now, I’m bearing through the chilly mornings. I want to enjoy what time I have left writing from my favorite spot. Don’t mind me. I’m just picturing where I’d thought I’d be at this point in my life. The goal was to be a fulltime writer/novelist by the time I was in my 30s. My 40s at the latest. I always had this Walden-meets-lake-house-in-south-Alabama picture in my mind where I’d spend my mornings finding some inner truth about what it means to be human, to inhale the nature of the world and spew it out on the page. Life has a funny way of taking you on twists and turns and side-streets and down-the-road-to-see-your-auntie and everything else in between. I’ve been fortunate enough to do work that I love for the past decade, but it’s not the big dream. My dream of being a writer led me down the path of creating a blog. Then, I learned to code so that I could fix things on my blog, which led me to a career in Web dev. Now, I’m back to the beginning. I need to continue focusing on the reason for me going down this path in the first place—writing. After 13 years since my first attempt at a novel, I decided it was time to put effort into realizing my dream of being a novelist. Therefore, I decided to give National Novel Writing Month another go. The challenge was to write 50,000 words toward a completed first draft in 30 days. I passed the mark three days early. I wrapped up the month with 55,216 words. Trust me when I say that is no small feat when you’ve built up 13 years of fiction-writing rust. Today I want to share some of the things that I learned during this journey. When I tell people about the challenge, one thing they always say is that there’s no way they’d come close to writing that many words in a month. While I did say that it’s no small feat to punch out 50K words in a month, it’s actually not that hard when you break it down to smaller goals. To hit that magical 50K finish line, you must average 1,667 words each day. That doesn’t mean you must hit that number every day. You can start out slower, get your writing muscles in shape, and finish out strong. I kept a personal goal of shooting for at least 1,500 every day. I only seriously undershot that goal on 2 days—once when I was sick with a stomach virus and once on a busy Thanksgiving-esque weekened dinner with the family. I still wrote on each of those days without hitting my goals, but that was okay. When it comes right down to it, consistency is more important. This is something I’ve learned over the years from Web development and other challenges I’ve taken on. Putting in daily work, no matter how much, will keep you on track for doing whatever it is that you set out to do. Writing 1,000 or 2,000 words in a day is nothing for me. I do it often when writing blog posts, tutorials, or some form of documentation. I’m certain this post will be in that ballpark. Keeping that pace every day for a month made for a bit of a challenge. The best piece of advice I can provide to anyone who might be considering writing a longer work of fiction is to not worry too much about the end goal of hitting 50K, 75K, or even 100K words. Think about consistently working on your manuscript and setting up smaller goals for yourself along the way. One of the things I’ve tried to teach my younger brother recently is that he must put in the time and work to become a great songwriter. Talent is not enough to take him to the next level. Writing songs whenever the mood strikes you is not a great plan of action if your imagination isn’t in the mood every day. In the opening paragraphs of this post, I laid out an idyllic vision of a writer’s morning. We all have these pictures in our heads of great artists building the most beautiful works of art when their muse gifts them with their next creation. In reality, it’s all about honing your skills. Learning the craft. And doing it over and over and over. When I first became a Web developer, I sucked at it. I mean I really sucked. I wrote my first bit of HTML code in the spring of 2003. It’s been 15 years now, and I’m still learning new things all the time. I’m always becoming better at what I do. I’m a few chapters away from completing this first draft that I began on November 1st. As an avid reader, I can tell you that it’s not particularly good. I’m okay with that. It’ll probably be a while before I create something that I’m ready to share with the world. What I have done is learn. I imagine in 10 years that I can look back and share this first draft as an example of everything not to do when writing a novel. I know it’s a cliché, but it’s a good one. It’s a saying that we all learn from the time that we’re children. I will continue practicing and one day publish a novel. Today is the first day that I’m not required to write anything toward my first draft. The challenge is over, but the manuscript is unfinished. I’ll probably write something anyway. It’s in my bones now. Writing has become an addiction that I must satisfy. I am going to slow my pace a bit. My next challenge is about finding the right balance between writing and my regular design/dev work. There’s only so many hours in a day that a person can spend doing deep work. Because I’m in a field that requires a high level of creativity, I need to not burn it all out on writing. I must save some of that energy for putting food on the table. My new writing goal is going to be to hit 1,000 words each day until I complete the first draft. I’m estimating another 15,000-20,000 words before the story is complete. If all goes well, I will have completed my first first draft of a novel. I’d like to say that I’ll move immediately to the first revision phase of my current novel in January. Being perfectly honest, I have a couple of other ideas that I’d like to get into. The act of creating a story has opened my mind to other ideas, and I’m itching to work on them. I’ll wait to see how I feel about that after I’ve completed the first draft and made it through Christmas. I will continue writing something. While I talk about this being work, I haven’t mentioned how much fun it is. I love stories. Books. TV. Movies. D&D (which I recently played for the first time). I love it all. The great thing about writing a story is that you get to learn and grow and laugh and cry with characters that you created. People ask me all the time what the story is about or what’s going to happen. I tell them that I don’t know; I haven’t finished the story yet. Writing is an act of discovery. With each new writing session, I learn something new about my characters that I didn’t know the day before. Non-writers think that’s weird and that I should already know what’s going to happen. The act of discovery is half the fun for me. With that said, I want to try my hand at plotting an outline in the next first draft. At least build a rough path for my characters to travel and return to if they veer off course. 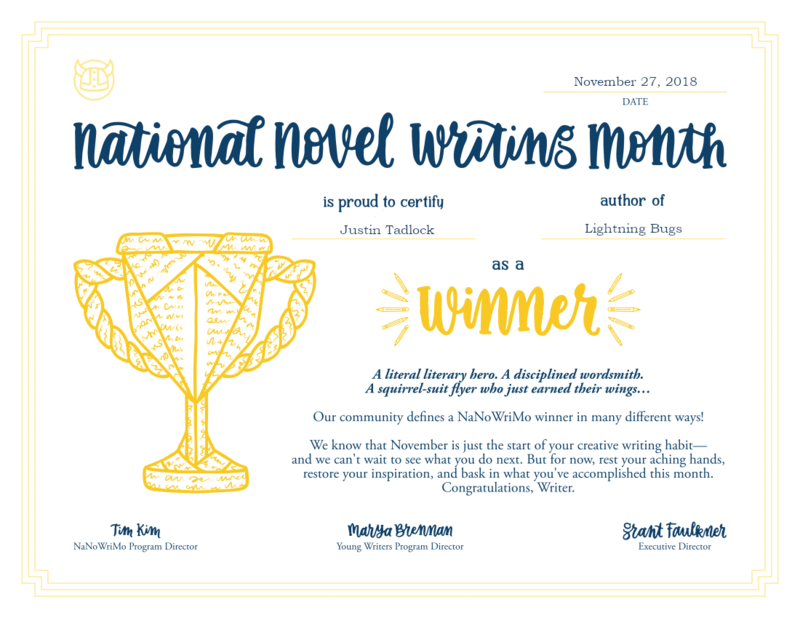 I was a pantser this NaNoWriMo, which is someone who is writing by the seat of their pants. I’m fairly certain that I’ll take on this challenge again in November 2019. In the meantime, I’ll keep working on my craft.